Please join the Harvard Club of the UK for an evening with acclaimed contemporary historian Sir Anthony Seldon. Sir Anthony, Vice-Chancellor of The University of Buckingham since 2015, is an expert on the last four Prime Ministers and will speak about the special relationship between British Prime Ministers and US Presidents. Gentleman must wear a jacket and tie. Ladies are required to dress with commensurate formality. 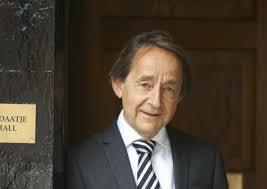 Sir Anthony Seldon, Honorary Historian for 10 Downing Street , is a leading contemporary historian, educationalist, commentator and political author. Sir Anthony was head of Brighton College and of Wellington College, two of Britain's leading independent schools. He is author of over 40 books on contemporary history, including the inside book on the last four Prime Ministers (John Major, Tony Blair, Gordon Brown and David Cameron), politics and education, was the co-founder and first director of the Centre for Contemporary British History, is co-founder of Action for Happiness, honorary historical adviser to 10 Downing Street, chair of the National Comment Awards, a member of the Government’s First World War Culture Committee, and a governor of The Royal Shakespeare Company.